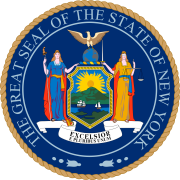 The 1896 New York state election was held on November 3, 1896, to elect the Governor, the Lieutenant Governor and a judge of the New York Court of Appeals, as well as all members of the New York State Assembly. Besides, a constitutional amendment on forestry was proposed, and rejected with 321,486 votes for and 710,505 against it. The Democratic state convention met on September 17 at Buffalo, New York, and endorsed the Free Silver platform of the Democratic national convention. Mayor of Albany John Boyd Thacher, a Gold Democrat, was nominated for Governor on the first ballot (vote: Thacher 332, William Sulzer (Free Silver) 88, Wilbur F. Porter 20). Wilbur F. Porter (Free Silver) for Lieutenant Governor, and Robert C. Titus for the Court of Appeals, were nominated by acclamation. Thacher declined to run, and the Democratic State Committee met on September 28 at the Hotel Bartholdi in New York City, Elliott Danforth presided. They moved Porter one step up, and substituted Frederick C. Schraub (Free Silver) on the ticket for Lieutenant Governor. The incumbent Vann was re-elected. At this time, automatic "ballot status" required 10,000 votes, which was reached by all parties. ^ The name was thus printed on the ballot. ^ These votes were not allowed to be counted, considering that there were over 500,000 votes with the name "Frederick C. Schraub". The "Fred" votes were returned as "defective" and, as it did not make any difference to the result, nobody objected.